This month for our World-Wide Wednesday segment, we will be examining Dutch baby names. These are classified as names that are mostly found in the Netherlands as well as the Dutch-speaking part of Belgium known as Flanders. Like many other countries, parents in present-day Netherlands are attracted to internationally loved names like Emma and Luca: names that are a bit more anglicized and less traditionally Dutch. While some things tend to change over time, there are still plenty of traditional names being given to Dutch babies. This article will focus on the interesting traditional choices available and how they were used in the past. However, many of these names are difficult for non-Dutch speakers to pronounce. In the case where one of the parents was a widower or widow, the first child of the gender of the deceased spouse was named after that spouse. The two eldest boys were named after the grandfathers and the two eldest girls were named after the grandmothers. In some regions only deceased grandparents were named. In most regions, the paternal grandfather and maternal grandmother were named first. If the first three children are all boys, sometimes a male version of the grandmother’s name is given to the third boy. If enough children are born, grandmother may have a girl named after her as well. The same is true vice versa, if the first three children are all girls. Children that had died were named. So if one son called Jan Hendrik died, the next one born would be called Jan Hendrik as well. Usually, if you see two children with the same name, the oldest one died before the youngest one was born. Be careful however, because if the two grandparents had the same first name, sometimes two children who were named after them ended up with the same first and last name! If all the grandparents, previous spouses and deceased children were named, siblings of the parents were named after, especially the ones who had died already. Knowing this information can also prove useful when tracking down ancestry lines. For our purposes today, it is mostly meant to be interesting. I enjoy learning traditions of the past since many of them are no longer popularly practiced. Even today, birthing traditions of old are still in place. Dutch parents tend to wait to find out the baby's gender until it is born. If they happen to discover it in advance, they won't reveal it. These days, more and more mothers are choosing to give birth in a hospital but the majority still follow tradition by having a natural home birth. Since the 17th century, it is customary for people to celebrate with a special liquor called "Hansje in the cellar". When a baby is born, the new mother is treated to plenty of food and gifts from visitors. In return, the new parents provide a kind of biscuits to their visitors. These snacks typically had a layer of butter and sugar sprinkles called muisjes. These sprinkles only come in pink, white and blue and are used to indicate the baby's gender. The muisjes are aniseed sprinkles that are said to represent fertility and scare away evil spirits. It is also good for the mother's milk supply. This snack is known as "Beschuit met meisjes". Muisjes literally means "little mice" and draws its name from the fact that the aniseeds sometimes look like they have little tails when dipped into sugar. This snack is still used to celebrate the arrival of a new baby today. Dutch children are sometimes given several names but not always. Half of them only receive one name, about 30% get two names, 17% have three names and only 2.5% of children receive four names. Rarely are there more given. The first name is usually the one used in daily life and will sometimes be shortened to a diminutive form as a nickname. The naming rules for the Dutch are loose. Nearly any name is allowed as long as it isn't too similar to an existing surname, or inappropriate. In the first period of naming history, the Germanic names lasted the longest. Most Germanic names are composed of two elements. The second usually indicated the gender. These elements could be drawn from two names and combined to create a new one with an appealing meaning that also honored two people. For example, a father named Hildebrant and a mother named Gertrud might name their child Gerbrant or Hiltrud. The second period of time began around the 12th century. Christian names were huge. Some Germanic elements still remained if they happened to also be the name of a saint. However, it was not the church that initiated this naming transition. There were no regulations in place regarding names. Religion and various current events had a big influence on naming tradition. Christian names became fashionable as larger cities began to flourish. Citizens with wealth and influence became trend-setters. It was then that the more typical Dutch names emerged such as "Kees" (Cornelis), "Jan" (Johannes) and "Piet" (Petrus). The third period of naming history was one of stability. Some parents just picked names that they liked because they could, or they'd choose something relevant to the family's occupation. For instance, a butcher who planned on training his son to also become a butcher would probably name him Sint Joris which is the Dutch version of Saint George, the patron saint of the butchers. At the time, there was even a strong superstition that a name had a bit of a reincarnation effect which led to many naming children after a deceased relative. Once the first four were named, the pattern relaxed a bit and parents were afforded more liberties to choose any name they liked for the following children. Names were reused if one of the children were to die. The fourth and last period of time extends to today. Once World War II ended, people found themselves a bit less tied to keeping to traditions. They grew less religious and stopped using Christian names as often. Many names became a bit more anglicized and children weren't named after relatives as much. 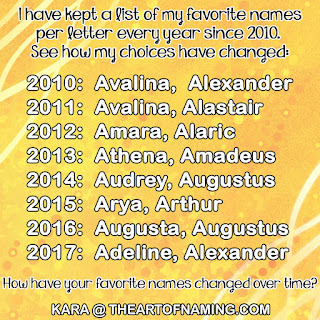 Today, children might have a traditional official name for a middle name and a more modern choice for their first name. Boys tend to have traditional Dutch names more often than girls and are still given family names. Girls simply receive names based on the parents' taste and love for it. If you'd like to learn more about how surnames are given, click here. I'm going to skip over that information to keep this article from growing too long. Which of 2013's Top 20 names in the Netherlands are your favorites? Share your thoughts in the comment section below! Of the Top 20 I actually really love Tess & Levi! My favorite name of all time! I love this! !